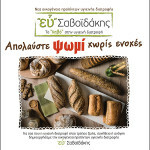 As for Savoidakis Company, the concept “extra fine” accompanies all activities, from the selection of raw materials, the production and the packaging to the distribution and the customer service. Further than the product quality and safety standards, we focus on the satisfaction of our consumers. And more than that, we constantly seek ways to go from good to great, from fine to “extra fine”. The range “ευ Savoidakis” is meant for all of you who believe that healthy eating is not only a philosophy or lifestyle but also a necessity.